From September 24 to October 30 an international contemporary art exhibition After Socialist Statues was on display at Kim? Contemporary Art Centre. Opening night – September 23, 7 p.m.
Exhibition After Socialist Statutes in Riga brings together artists from the former Eastern Europe who have developed their works in and about one city in the former Eastern bloc countries – Tallinn, Riga, Poznan, Vilnius and Tbilisi. The exhibition is specifically developed for the very context of Riga and that specific neighborhood where Kim? is located – Spīķeri quarter wrapped in historically dense charms of Central Market and Moscow Vorstadt urban district. Being so multifaced, the area has become a perfect starting point for a show to discuss these developments and overlook artistic approaches to recent changes in built environment in the former Eastern Europe 20 years after the fall of the Wall and removal of heroic statues from the central squares and street corners. Of course, many radical changes have happened in the public space, from the perspective of both planners and users of the city space. Privatisation, gentrification, suburbanisation would be the main keywords characterising the developments in post-Socialist cities which also brings into the light the changes in urban life-styles and patterns of behaviour in public space. At the Kim? first floor exhibition hall video, photography, installations and drawings by a participant of this year’s Cēsis Art Festival Flo Kasearu (Tallin), artists Paul Kuimet (Tallin), Franciszek Orłowski (Poznań), Sophia Tabatadze (Berlin/ Tbilisi), and Vita Zaman (Berlin/ New York) are presented. The works delicately grasp the flow of time, as well as fixate and demonstrate the critical view of contemporary art on social, political and cultural environment that has formed during the two decades after the fall of curtain. 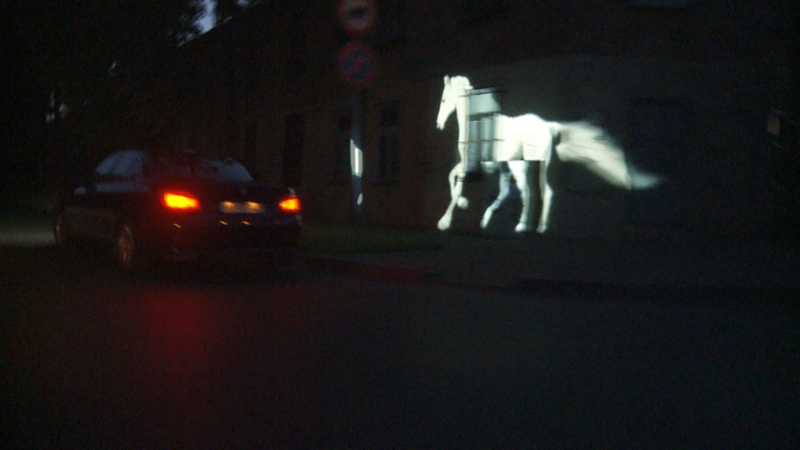 A vision of a white horse galloping through the dark streets of Riga, running a race against BMW, and finally vanishing into nothingness with the appearance of first rays of light similarly to unfulfilled dream1; the heavy breath of the city transforming into a tent made of artist’s scraped vagabonds’ clothes; a neighborhood where landscape is shielded by newly erected buildings expressing the yearning for a property-filled life, and more … The project confirms that artists are still inspired by themes related to territories and identity. The exhibition was accompanied by a catalogue introducing the participants and offering texts written by artists along with art theoreticians who are well-acquainted with historical contexts. These are forewords and artwork analysis accompanied by imagination wandering through post-socialism cities. Among the authors are: curator of the exhibition Rael Artel, Warsaw-based curator Romuald Demidenko, art historian from Riga Maija Rudovska, Kim? Executive Director Zane Onckule, and artists Franciszek Orłowski and Paul Kuimet. Catalogue also served as a map to the exhibition, and it was available for donations. After Socialist Statutes is the second stop for the traveling cycle Your Periphery Is My Centre curated by Rael Artel (Pärnu). The first exhibition in project series Lost in Transition took place last summer in Contemporary Art Museum of Estonia in Tallin. The exhibit included works by Latvian photographer Arnis Balčus, among others. Furthermore, the third exhibition of this cycle with participation of Latvian artist Kaspars Podnieks will take place in November 2011, in Białystok, Poland. 1 The work by Flo Kasearu Riga Runaway was shot during last June in Riga, specifically for the exhibition After Socialist Statues, in collaboration with curator Rael Artel and Kim? Contemporary Art Centre.